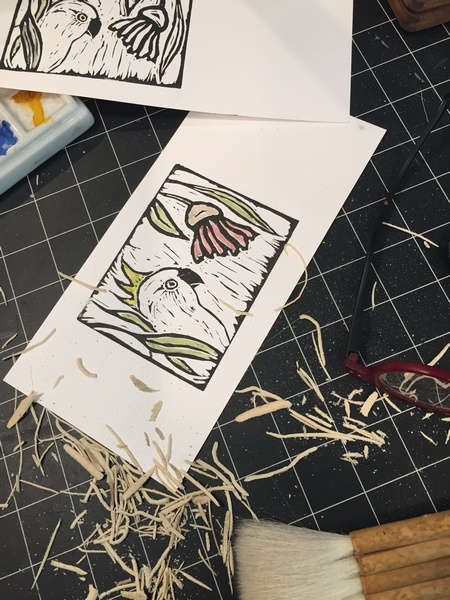 I did not like the way the first carving for the cockatoo turned out. Too much white on white. I should have taken the time to do a drawing and then it would have been obvious. Late in the day I have little patience and should just leave the studio. 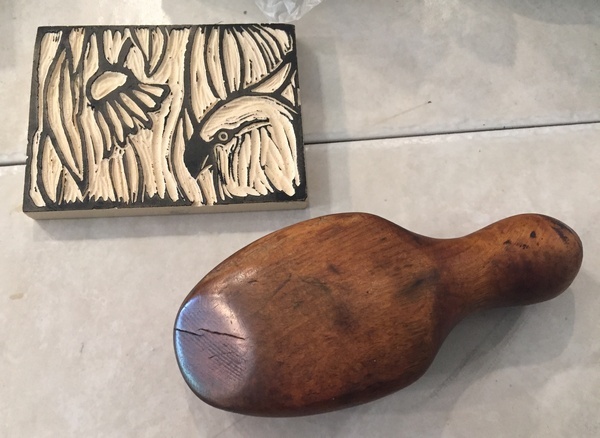 I had to carve a new block for the cockatoo and gum tree bloom. The other did not have enough contrast for the bird that is white. But since there was no more of the linoleum blocks that were the same size, I resorted to a very old EZ cut rubber sheet. It worked but the material is so crumbly I don’t think I would use it again. 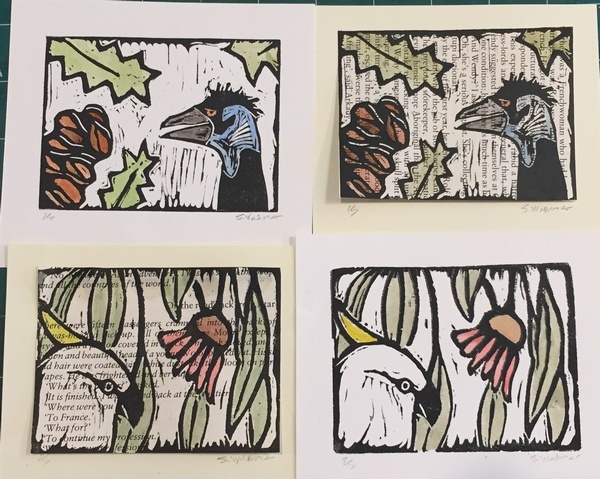 Anyway the three birds of the Songlines series is finished. And the best thing to do the rubbing for transferring the image to the paper is this old child’s shoe last. See that flat spot? It is perfect! And it fits into the hand just right. No wooden spoon needed and the pressure is more evenly directed. The emu and banksia was fun to carve. Here they are colored in. 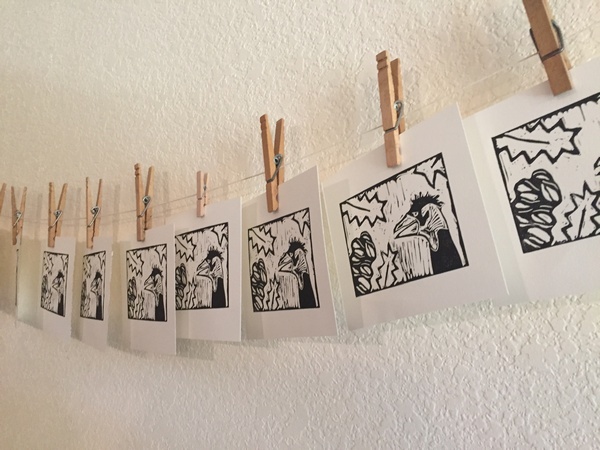 I used more of the Songlines book pages for these as well. 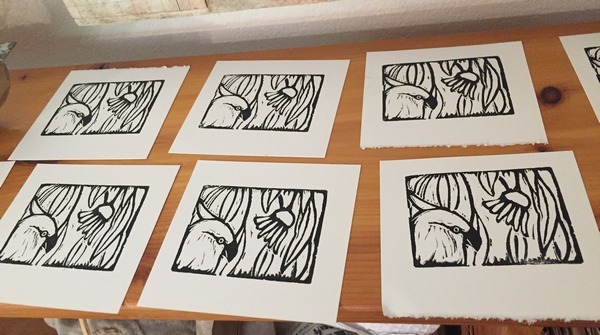 Now I just have to print up sets of cards and package them all up to take to Australia. 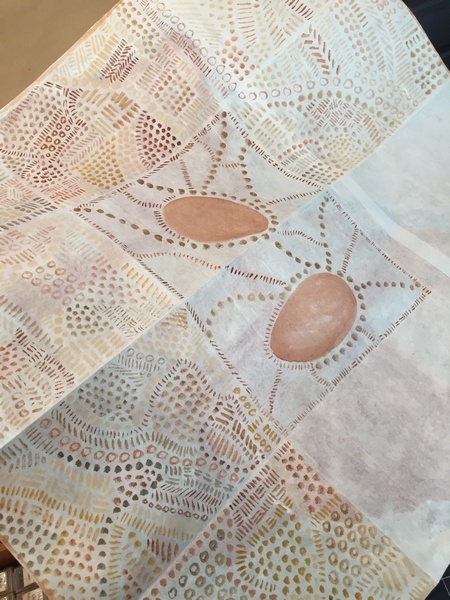 The back of the Australia pigments map was bothering me….just plain off white paper. So now I am doing this. Only three more sections to go and it will be finished. Probably put a sealer on it because it will be handled so much. 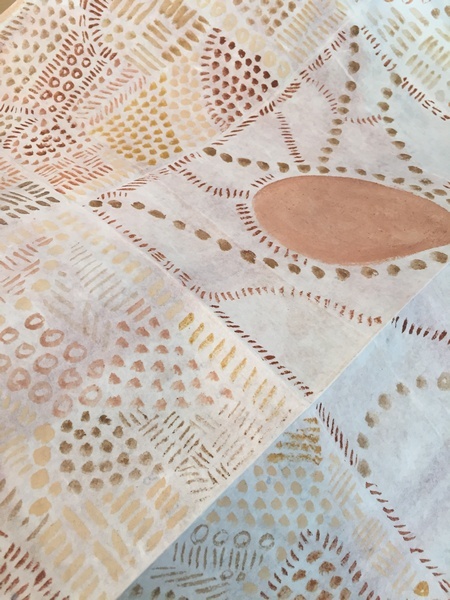 I am only using the watercolors made from soils of Australia. It seems as though I will never use them up. The studio smells of cloves because this box of watercolors that holds eighty-four different ones was rushed into the containers and closed up too soon. So I had to open each of them, to clean off and add oil of clove. That was a few years ago and they still smell like the old dentist offices of the late sixties, early seventies. Anyway there is just enough of this painting on the back to leave a ghost like image when you hold the map up to the light. And that seems somehow appropriate. And it certainly takes care of my horror vacui. Next week I will start printing the photos for Lee’s book for provoking memory. We are having company for dinner tonight and again next Tuesday. If I keep the meals simple and wine at the ready, I can do this….but no where near as often as we did before. Things change.